This would have been a delicious crepe - except there was no nutella. I ordered and paid for a nutella and banana crepe with the additional topping of lingon berry preserves. There was lingon berry preserves and banana but not the nutella. I was so very disappointed. While the crepe was good, it was not what I wanted, it was not sweet enough, and I paid too much money for it (since it was missing a key ingredient). Delicious, loved that the crepes were made fresh on the spot, a bit too much food for one but my office mates were more than willing to share. This was the best hot chocolate I ever had! So delicious. Eaten here a few times, and it is always good. Plus the two men working are pleasant and great chefs! This is a very charming truck! This is my number one food truck. Mounir & Roberto have put together the complete package. They are a delight to see each and every time I visit. I have never been disappointed eating here. The veggie crepes and dessert crepes are awesome. I have been to France so I know an authentic crepe. They also prepare some interesting fruit teas. They are a must try and then you will be hooked! The decor pulled me in (window flower boxes!) but the customer service and great food will bring me back! 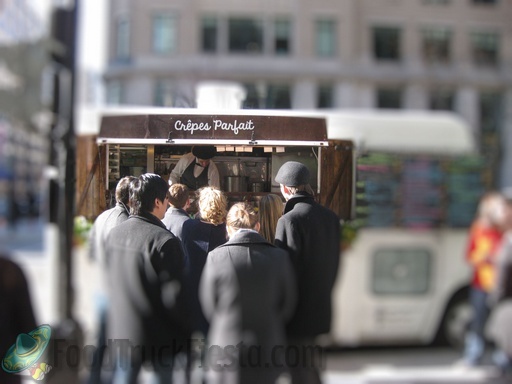 While I usually prefer sweet crepes, I was very pleasently surprised by their savory ones - fresh ingredients, quickly and perfectly cooked, and wonderfully portioned so you're full, but not overly so. And did I mention the great customer service? Genuine smiles and the themed attire set them apart from many other food trucks, but they seem to truly enjoy what they're doing. They're at NoMA on Mondays, and I'll be sure to visit! I paid two dollars extra to make the special of the day gluten free. It was worth every penny. 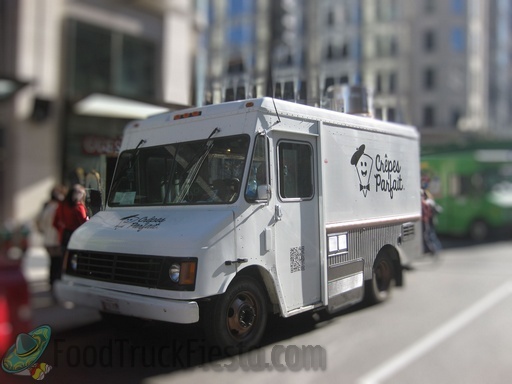 Eating gluten free is not fun, tasty, or cheap but every time I visit this truck it's the opposite. Everything is fresh, organic when possible, delicious, and reasonably priced. One note for people with celiac that aren’t just gluten intolerant: I don’t know if the gluten free crepes are cooked on the same griddle the regular crepes. 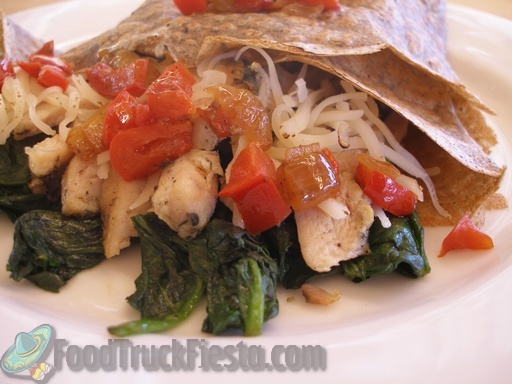 For those of you that simple love great food and can eat gluten don’t pass up this truck. They have all your favorites as well. 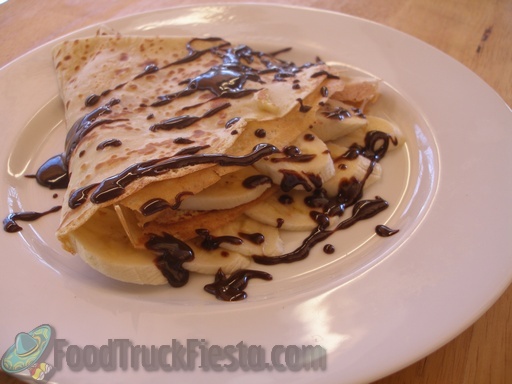 Although their savory crepes are wonderful, if you ever make the mistake of trying the dessert crepes you will be hooked. This is by far one of the best looking food trucks I've seen and the service was top notch. Not to mention the servers were dressed in bow ties and berets BUT the shrimp crepe I had was not good. Not even tasty. I'll try once more but for the first impression BLAND. I love this truck. The men working in it are pleasant and a bit funny. The food is not super fast, but the wait isn't long and is completely worth it. They cook the crepes to order. Their special dessert crepe always draws me in. I am a fairly big eater, but I can't finish my savory crepe so I save my dessert crepe for the afternoon. I am sure they are better warm, but they are very good cold. I usually heat the savory crepe leftovers up for a big snack or for dinner. I never throw away my leftovers from this truck and the dog usually misses out completely, too. Apr 03, 2013 by Loretta C.
Appearance: Just plain adorable. You just feel happy standing near it, especially with the music from Amelie playing and the chef dressed as a chef making your crepe. Food: Perfect portions, delicious but healthy. Can't say that about most places. Eco-friendly: Doesn't use styrafoam, microwave, and stuff that's not good for you. Best of all: The guys are nice! Can't really ask for more. You guys are awesome!! Is This One Of Your Favorite Trucks? : Yes!! Not only was the crepe perfectly proportioned between the creme fraiche and orange, I got the greatest smile from the food truck operator when he handed it to me. I could tell that both of them truly love their work and strive to provide the best food and service. 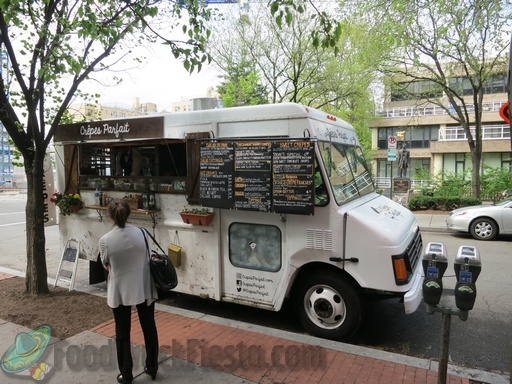 Crêpes Parfait is a Washington DC mobile creperie, serving traditional, organic and gluten free crepes, both sweet and savory. Crêpes Parfait brings traditional Old World flavors to Washington that are typically enjoyed in northern France. The perfect 15-inch crêpes are cooked on old fashioned cast iron griddles with sweet and savory fillings. After the grand opening, all crêpes will be competitively priced between $7-$9 with up to a quarter pound of fillings that will satisfy any meal. Specials and combination meals with soup and a beverage will target a very happy $10-15 price point. For gluten-sensitive patrons, a gluten-free version of all crêpes are available. 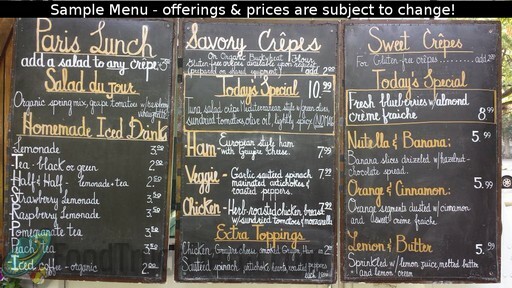 The savory crêpes consist of a selection of meats, vegetables and imported cheeses on organic buckwheat flour, also known as “Gallettes Bretonnes” in France. Sweet crêpes are served with a selection of fresh fruits, chocolates and imported preserves, made with white flour, also known as “Crêpes Sucrees” in France. Roberto Catanuso and Mounir Elhilali were first introduced while working at a Washington, DC restaurant in 1998. The restaurant duo appreciated each other’s professional skill, passion and dedication—while naturally forging a friendship with entrepreneurial ambitions.